As a way of saying thanks to all of the fans who made Halfbrick Studios Blast Off the most successful and critically acclaimed PSP mini title to date, the developer has released the suitably mini soundtrack for free. PSP minis are about quality over quantity, and Blast Off is the poster game for the concept, delivering a short and sweet experience enhanced to no small degree by its short and sweet ambient soundtrack. It's only four tracks - one for each difficulty level - but the music is lovely, and the price is right. 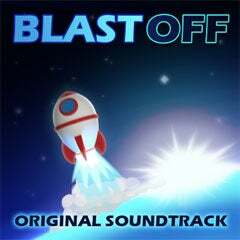 "To celebrate the New Year and the critical acclaim we've received for Blast Off, we've decided to release the soundtrack for free as a super awesome gift to you all. Enjoy your holidays to the ambient and introspective tunes of everyone's favourite PSP Mini space puzzler!" You can pick up the four tracks right now via torrent in MP3 or Apple Lossless flavors.